SAN SALVADOR – Salvadorans began observing three days of national mourning Nov. 10 for the 130 people who died in floods and landslides caused by Hurricane Ida. The storm, occurring Nov. 6-8 during what normally is the start of the dry season, left thousands homeless and in shelters. Large areas of the country remained without power as the mourning period began. President Mauricio Funes declared a national emergency as the government and aid agencies rushed to provide food, water, clothing and other assistance to victims around the capital of San Salvador and the central province of San Vicente. More than 13,000 Salvadorans who lost their homes were in shelters Nov. 10. In Nicaragua, relief workers were hindered in their efforts to get supplies to remote communities affected by the storm by washed-out bridges and roads. The Nicaraguan government estimated that at least 8,000 people were displaced by the storm. Catholic Relief Services and other aid agencies were assessing how best to respond in the neighboring Central American countries. Some parts of Nicaragua still were recovering from flooding in August that destroyed large portions of the bean and corn crops. Many of the same areas lost crops again in the downpours that lasted for more than two days. Brian Gleeson, CRS country representative in El Salvador, said staff were in the field determining what people needed most. He complimented the Salvadoran government for its response to the storm as it tried to assist the thousands who were in shelters. “It’s definitely localized and if you weren’t in a region that suffered a landslide, you wouldn’t know the situation was that bad,” Gleeson told Catholic News Service. The Salvadoran weather service reported that nearly 14 inches of rain fell in a matter of hours in the area surrounding the San Vicente volcano in the central part of the country. 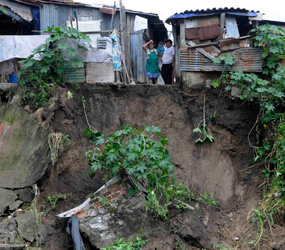 The communities of Verapaz and Tepetitan were partially buried under mud and rocks that swept down the sides of the volcano.